LikeSo is your personal speech coach! LikeSo motivates you to practice speaking articulately and confidently and brings awareness to your use, or overuse, of filler words along with your pacing. As with any kind of training, establishing goals and tracking your progress towards those goals are key motivators to improving your skills. 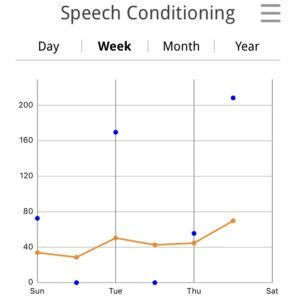 Our new Speech Scoring System uses Speech Quality Points (SQP) and a Speech Conditioning Score (SCS) to help you achieve your speech fitness goals and to ultimately improve your speech! What are Speech Quality Points? How good was your workout? We’ve designed the SQP so that the more you practice, the more points you accumulate. But like any type of workout, you have to have good form! 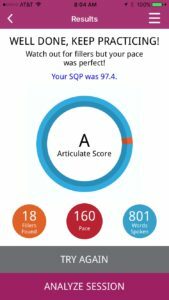 Our benchmark of 100 points is achieved with an Articulate Score of “A+”, which is achieved with 0-1 filler words, 150 wpm pace and 5 minutes of practice/talk time. Variations in filler percentile, pace and duration will result in a higher or lower score. For example, a pace that is deemed too fast or too slow will reduce the number of SQPs you earn in a session. What is your Speech Conditioning Score? Like anything in life, the more you practice, the better you get! This also applies to speaking skills. 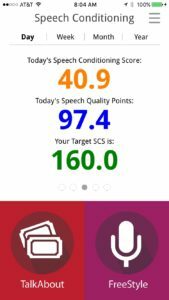 Our Speech Conditioning Score (SCS) provides a way for you to measure your training, set goals and achieve them! 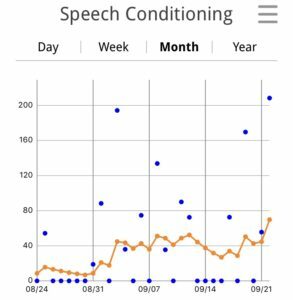 SCS is based on a formula that looks at your SQPs over the last 30 days and provides a daily score to indicate the “condition” of your speaking. The more you practice, the higher your SCS; go a few days without practice, and you’ll see your SCS decline. * Only saved sessions are used to calculate your SCS! The DAY view shows your current SCS in ORANGE and your total SQPs in BLUE. If you have set a Goal (see below), your Target SCS will be shown in GREEN. Each time you play, the resulting SQPs will be added to your day total, and your SCS will be recalculated as appropriate. The WEEK view shows your SCS (ORANGE) and SQP (BLUE) for each day of the current week (Sunday thru Saturday). If you have been practicing, you will see your SCS rising/improving! And if you have a Goal set (see below), your Target SCS will be shown in GREEN. The MONTH view shows your SCS (ORANGE) and SQP (BLUE) for each of the last 30 days. This view is helpful to see your practice patterns and the impact it has on your SCS. And if you have a Goal set (see below), your Target SCS will be shown in GREEN. What should your SCS be? If you are practicing for an interview using LikeSo’s conversation game, TalkAbout, and choose the topic “The Interview,” decide if you want to take 30 seconds or 60 seconds to respond to questions. If using 30 seconds per question, your Talk Time for the session will be 2.5 minutes, and therefore your target SCS should be near 50. If using 60 seconds, your target SCS will be about 100. Do you need to prepare for an upcoming event (e.g. presentation, interview, pitch or speech)? Our Goal feature can help! By setting a goal in LikeSo, the app will provide you with a Target SCS to help motivate your practice. Select the Type of Goal, Target Date and Length of Event that best matches the event for which are are preparing. LikeSo will present a Target SCS for your goal. 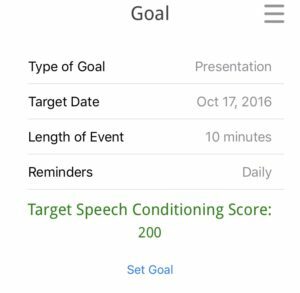 This Target SCS will also be displayed on the Speech Conditioning screen (Day/Week/Month views) to show your progress towards your target.